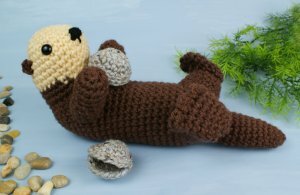 An original crochet amigurumi Sea Otter pattern by June Gilbank. Sea Otters are both the smallest marine mammal and the largest member of the weasel family. Their fur is the densest of any animal and traps a layer of insulating air bubbles within it to keep the otter warm in the cold ocean waters. Sea otters almost never leave the ocean. They float on their backs to rest, groom and sleep. Their diet is shellfish and crustaceans; they often use a rock as a tool to crack open the hard shells. Pattern details: Also includes a bonus crochet pattern for making both closed and open clams for your sea otter! Date Added: 07/05/2018 by Rhonda T.
Made this for my otter loving man, and he loves it! Date Added: 05/07/2017 by Kristin G.
Date Added: 08/31/2016 by Verna H.
Date Added: 11/25/2015 by Linda S.
Date Added: 09/24/2015 by Jaclyn M.
Date Added: 09/09/2015 by Beth H.
Date Added: 09/21/2013 by Jeanne S.
Date Added: 06/13/2013 by Laura M.
Date Added: 04/12/2013 by Rebecca P.
Date Added: 03/13/2013 by Susan S.